See Pepper’s Ghost at Kitty’s Cabin! It is still possible to buy a small seasonal (no heat in winter) cabin in New Hampshire for a very reasonable price. Years ago I decided it would be nice to own a small get away on a lake, and ended up buying a small 600 sq.foot cabin. The cabin was held precariously up on a few rickety posts. It was all one room, with a small sleep loft. You had climbed an odd combination step/ladder to reach a loft you would not dare even try to stand up in to sleep. As with most bargains, the cabin turned into far less of one as the years went on. I decided the ladder/steps were no longer safe for someone my age, though in reality I just longed for a real bedroom where I could stand up and perhaps have a closet for clothing. A traditional addition was not possible as the cabin was “grandfathered” in being too close to the lake. I could not change the “footprint” of the cabin. The result of this footprint restriction was a booming business is raising cabins, putting in a whole new floor, and then lowering the cabin back down. My builder had done it so many times he assured us we didn’t even need to take the pictures off the walls. Watching the cabin go up, and then come back down with barely a creak onto a real foundation was fascinating. It was also expensive enough that my family and I decided to finish the inside of the new rooms ourselves . We gained not only a bedroom, but another bathroom and a small study that could also be used for guests. It took a few years for us to finish all the walls, floors, ceiling and molding work. Long before it was truly finished though I was enjoying my REAL bedroom. I have to admit that I’m at the age where I get up to use the bathroom in the middle of the night. that’s another reason I disliked the stair/ladder of the sleep loft! When designing the new space, it should be noted I decided to put in a glass French door for the bedroom. I wanted light from the big windows in the bedroom to reach the inner study room. So while it’s a little unusual to have a glass door to a bedroom, I had a reason. (I also later put a pull down roman shade on the door for privacy if needed). I went into the bedroom, and stopped as there was the lamp by the bed. At this point, I put on my glasses! I thought, “Maybe my husband brought the spare lamp here.” I looked over at the desk, and no lamp to be seen. It was the middle of the night in the deep deserted county (think Jason and other horror movies). I have to admit I was at the very least confused. So I did what any good skeptic did. I called Discovery and the History channels and told them I had a ghost in my house and to bring a TV crew over pronto. Actually what I did do was retrace my steps, this time with my glasses on. To my surprise, even with good vision the illusion was still there. At this point I was delighted instead of scared. I had accidentally created Pepper’s Ghost! If you have been to Disney World, you’ve seen the illusion used at the Haunted Mansion. It was originally used during stage productions. Wikipedia was a far more detailed explanation, but the effect is quite realistic in person. It’s more than just a reflection, it’s a reflection that seems to be projected into another scene. If I had just seen a reflection of the light and bedside table, I would have been “oh it’s a reflection”. It’s the superimposed light, and the lucky matching color of the bedside bookcase, that made the effect enough for my heart to start beating a bit more quickly. 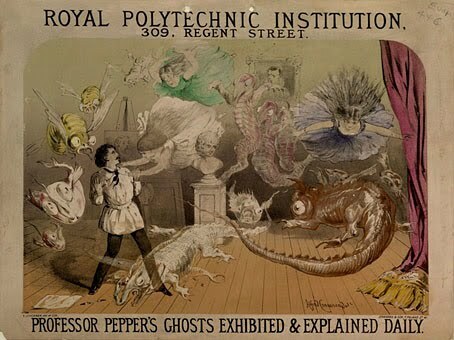 I happily show overnight guests at the lake cabin the newly added attraction of the “Pepper’s Ghost” illusion. Unlike Disney, I share my spooky effect free of charge! « It’s a bird, it’s a plane, it’s fooling a veteran Air Force pilot! And now I finally understand Pepper’s ghost. The Wikipedia article just confused me, but your video and description make it clear. Well, that’s just totally AWESOME!! Funny story! Well told, and the video is great.